Tripp Lite's P024-006-13A 1.83 m (6-ft.) Medium Duty Power Extension Cord allows you to extend the length of your existing power cord an additional 1.83 m (6-ft.) Features a NEMA 5-15R receptacle and a NEMA 5-15P plug. Constructed of 16AWG wire, the cable is rated 13AMP, 120Volts. 16 AWG, 13A Power Cord Extends Your Existing Power Connection by 6 ft.
Tripp Lite’s P024-006-13A Power Extension Cord extends the length of an existing power cord by an additional six feet. Featuring a NEMA 5-15P plug on one end and a NEMA 5-15R receptacle on the other, the P024-006-13A improves the functionality of power cords with higher amperage ratings. 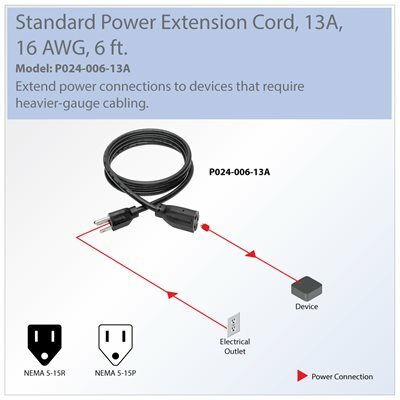 To establish a power connection, simply connect the 5-15R end to a power cord and the NEMA 5-15P end to an AC source. The P024-006-13A is manufactured using superior materials and is tested to UL standards 817 for optimal product safety. The high-quality molded connectors are designed for reliable service and long life. This SJT cable has three 16 AWG conductors and is rated 13 amps for cooler operation. For peace of mind, the P024-006-13A comes backed by a lifetime warranty. It’s manufactured in compliance with strict RoHS specifications, reflecting Tripp Lite’s commitment to environmental responsibility.